This afternoon I’m heading to south Orlando for my first National Women’s Conference sponsored by The Gospel Coalition. To say I’m excited would be an understatement. It’s good to go to conferences such as these. It’s a time to pull away from the normal routine and make room for God. I am looking forward to seeing what He will say to me through His Word, primarily the book of Nehemiah. I’m excited to gather with friends far and near to reconnect and hear what’s going on in their lives. I’m excited to see how what I learn will help me in the days, weeks and months ahead to be a better wife, mother, Nana and friend. God uses our weak efforts to make lasting marks on our lives, and I’m confident this is one of those times in my life. I invite you to follow me on Twitter as I’ll tweet throughout the conference quotes worth sharing and Truths I hear. 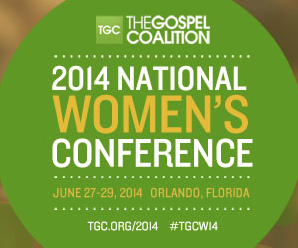 You can also follow along using the hashtag: #TGCW14. There is a lengthy list of speakers including Tim and Kathy Keller and John and Noelle Piper. I have no idea what God will do in my heart this weekend, but I do know that I’m going full of faith and expectant that what He does will surprise and amaze me. When was the last time you pulled away in this way? How was your life impacted for good? This entry was posted in Growing Strong Marriages, The Gospel & Marriage, Wives and tagged John Piper, Kathy Keller, Nehemiah, Noelle Piper, The Gospel Coalition, Tim Keller, Women's Conference. Bookmark the permalink.